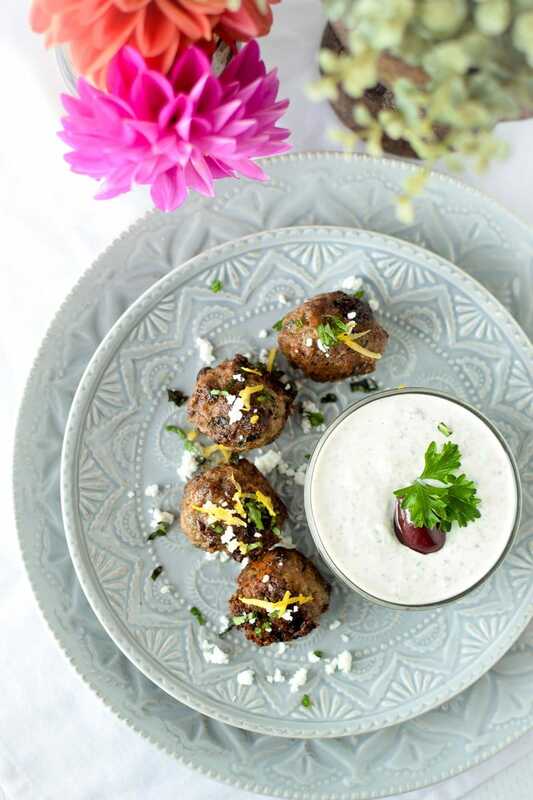 Made with the Mediterranean flavors of kalamata olives, fresh herbs, and nutritious lamb, these Greek Lamb Meatballs are the perfect dairy-free, gluten-free, high-protein snack, appetizer or main course. Disclosure: I went on a sponsored trip to New Orleans at the Goldring Center for Culinary Medicine at Tulane University with Nourish with Lamb, but was not compensated for this post. All opinions expressed are my own. I am a glass half-full type of girl, and I like to think I incorporate that into my nutrition philosophy as well. 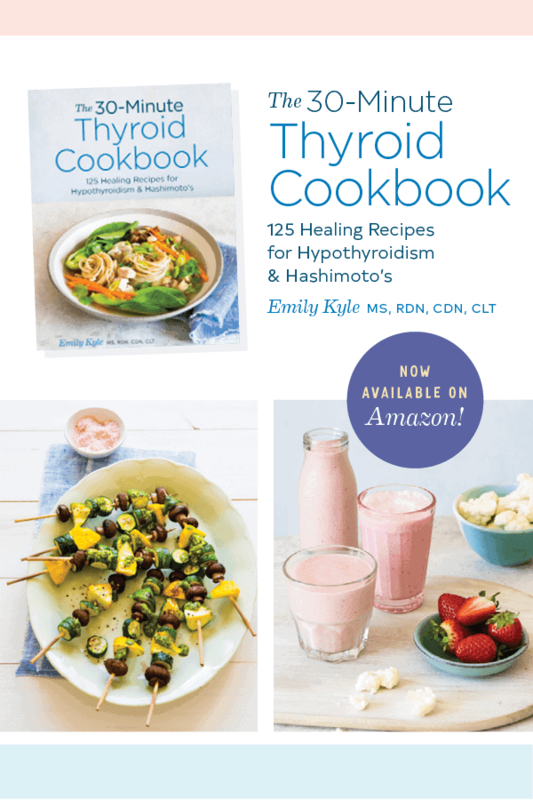 I would much rather focus on the delicious, nutritious foods that I can incorporate into my diet, rather than the foods I need to eliminate or take out. Which brings me to lamb – a wonderful, highly nutritious red meat that I had never even eaten before. Despite never eating it before, I was quick to say “I don’t like it”. 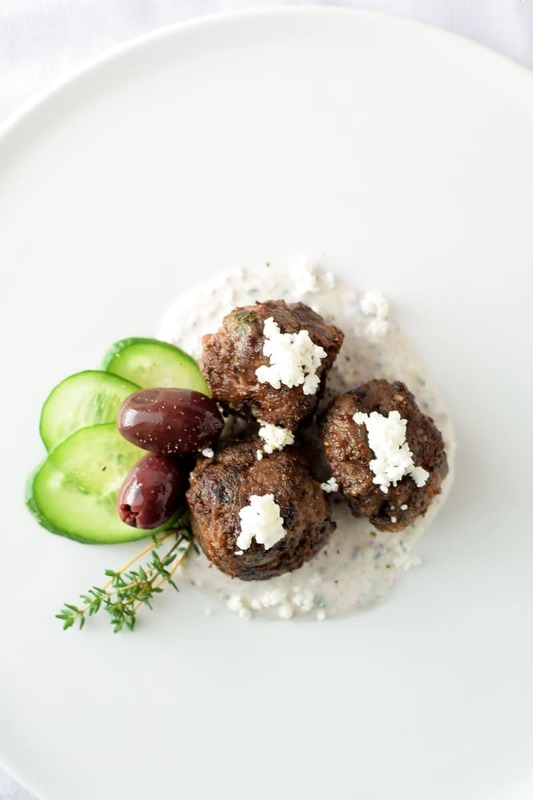 So when I was invited to the Goldring Center for Culinary Medicine at Tulane University in New Orleans, Louisiana to learn more about lamb, I was nervous but I said yes! . In a two day retreat, I joined Nourish with Lamb for the workshop – A Tale of Two Trends: An Exploration of Two Trends Shaping the Future of Food: Lamb and Culinary Medicine. In this post you will find everything I learned while on my trip, including why lamb is the best choice for red meat in terms of their environmental and sustainability impact, as well as the many health and nutrition benefits of this delicious meat. In my vow to be more transparent and authentic, I noted that I would be talking more about my decision to eat meat. For so long, I was almost afraid to admit that I ate meat, trying hard to blend in with the popular vegan and vegetarian communities. But the truth is, I was a vegetarian for 9 months (and a vegan for 2 )back in college, and I found out that for me to feel my best, mentally and physically, I need meat in my diet. That is not to say that I do not support vegans or vegetarians, or that I do not fully embrace a plant-based lifestyle, that’s just simply what works best for me. My upbringing and current lifestyle strongly influences my decision to eat meat, too. I grew up and still live in a very rural, in a small town country where the farmers are my neighbors and animals and crops are raised for food. Eating meat is a part of my lifestyle, and I am happy and content with my decision. As a omnivore, I recognize my responsibility to be sourcing the most local, humanely raised meat I can find. I no longer purchase meat from the grocery store, and instead purchase my meat from local farmers across the county. I do not support factory farming methods and I take pride in supporting my neighbors and local economy by making educated decisions on where to purchase my meat. Am I 100% perfect? No. Will I turn down a meal at a friends house without knowing where the meat came from? No. But I do try to do my part in being a responsible meat eater. With that being said, I was most delighted to learn that when it comes to caring for lambs and sheep – there are no factory farms. All lambs and sheep are pasture-raised and grass fed on family owned ranches with love and care. Shepherds, or those who care for a flock of sheep, are multi-generational farmers who are committed to practices that foster animal well-being throughout their lifespan. When it comes to environment and sustainability, lamb producers strive to provide consumers with a high quality protein that preserves the land and supports the health of consumers and farmers alike, for future generations. 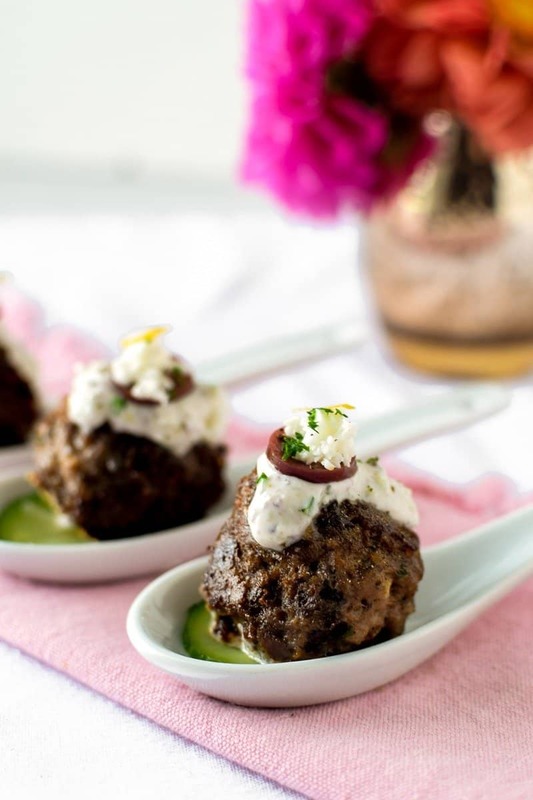 Lamb is a staple protein in a healthy Mediterranean-style diet, particularly in Greek cuisine. On average, a 3 ounce serving of lamb is lean and has only 150 calories. Naturally protein-packed, this nutrient rich red meat that is composed of nearly 40% of heart-healthy monounsaturated fatty acids. A single portion of lamb provides over half of your daily protein needs, making it an ideal fuel for active bodies. With a variety of essential vitamins and minerals including iron, vitamin B12, niacin, zinc, selenium and riboflavin and even alpha linolenic acid, an important omega-3 fatty acid. A 3-ounce cooked portion provides, on average, 34% of the Daily Vlue of niacin, a B-vitamin which aids in many metabolic functions. Selenium functions as an antioxidant. A 3-ounce cooked portion of lamb qualifies it as an excellent source, providing 20% of the Daily Value. Lean Lamb is a source of healthy, unsaturated fats. Nearly 40% of the fat in lean lamb is heart healthy monounsaturated fat. On average, a 3-ounce portion of cooked lamb provides 92% of the Daily Value of vitamin B12. Found only in animal products, vitamin B12 supports many metabolic functions. A vitamin B12 deficiency may lead to anemia or neurological problems such as difficulty walking, memory loss and disorientation. Protein is an important part of your plate because it can lower the blood sugar impact of meals, can encourage feelings of fullness, and can help preserve lean body mass. A single portion of lamb provides almost half your daily protein needs. A 3-ounce portion of cooked lamb provides, on average, 38% of the Daily Value of zinc. Inadequate zinc intakes can contribute to improper growth and development, reduce immune function, and delay wound healing. In a large bowl, combine all of the meatball ingredients. Using your hands, mix together well. 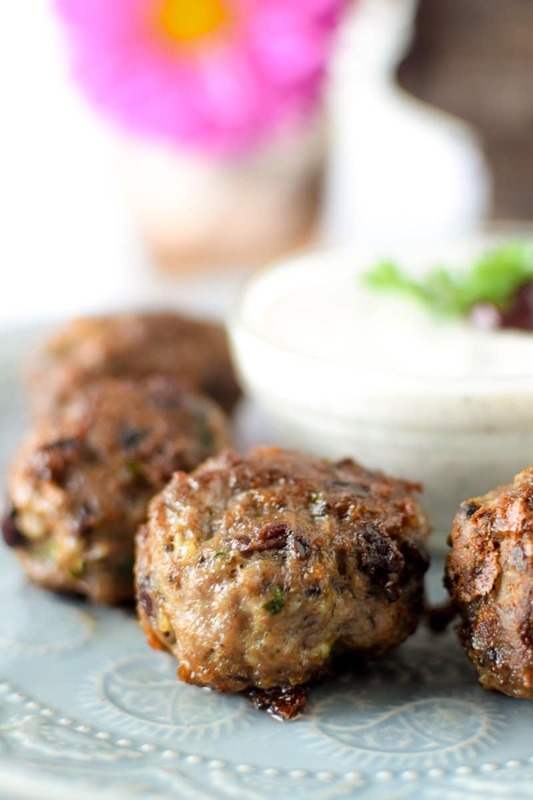 Once the meatball ingredients are mixed together well, roll into 1" meatballs. Set aside. 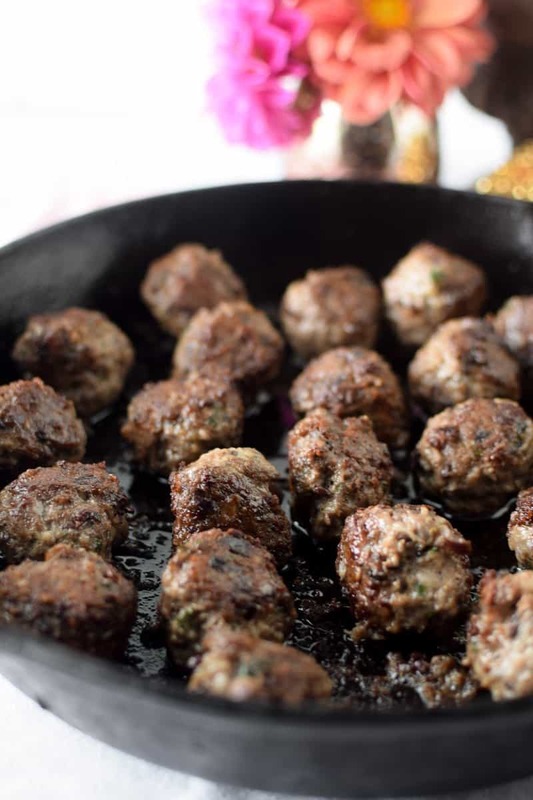 Add the oil for frying in a large cast iron skillet and neatly arrange all of the meatballs inside. Heat the meatballs over medium-high heat. Use a oil splatter screen if necessary to protect yourself from oil splatters. Cook the meatballs for 3-4 minutes on the first side. They are ready to flip when they easily release from the bottom of the pan. Flip and cook on the other side for 3-4 minutes, rotating to the other sides as necessary to ensure an even crust. Cook the meatballs until an internal temperature of 155 degrees is reached. Combine all ingredients in a small food processor and blend until fine pieces are achieved. 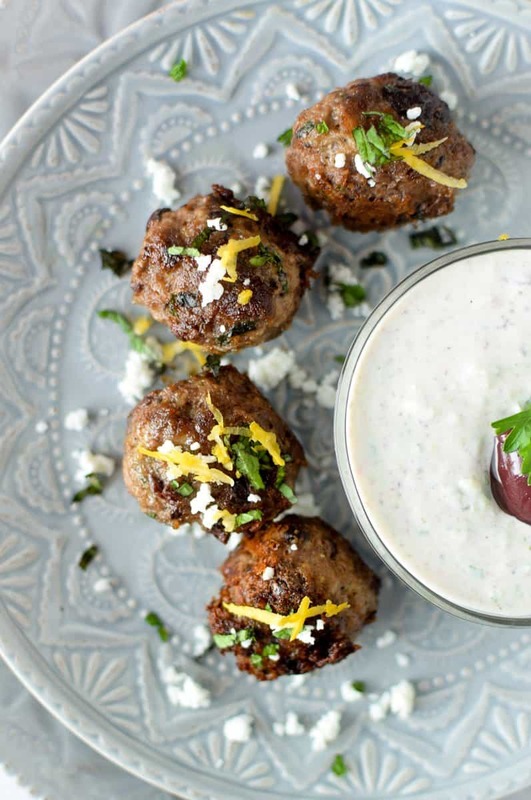 Serve as a dipping sauce with the Greek Lamb Meatballs. can I bake these instead of fry? I was a lamb newbie too – but am in love now! Hope you love them! Ok, complete lamb newbie here but helllloooo deliciousness! Lamb is such a treat! Healthy and flavorful! I had the best time with you! I am adding your Lamb chili to my meal prep list too!! I am so glad to hear this, thank you, Meme! 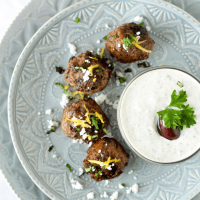 Definitely the most tasty lamb meatballs I have had! 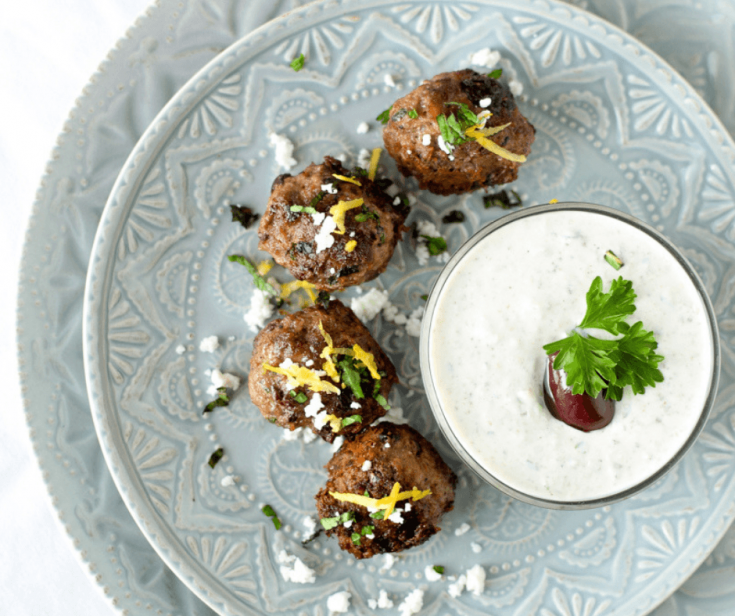 Had so much fun with you on this trip – I just bought ground lamb so I am adding these to my list to make this week! Thank you! These are so good! And I love your plates, beautiful!